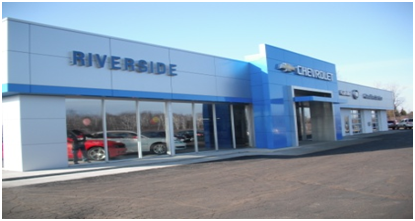 The scope of work that was performed for this project was based on the renovation and expansion of the former Bero Motors in Escanaba, MI. The Construction of this project consisted of asbestos abatement, contaminated soil remediation, demolition of foundations, walls, car port, ceilings, flooring, windows, and reconfigure existing mezzanine. Project also included construction of two additions, engineering, concrete foundations, drywells, CMU block, structural steel, newly configured walls, parapet wall framing, interior treatments, casework, doors, frames, hardware, Commercial Overhead Garage Doors, windows, ACM metal panels, EPDM roofing, Thermal Insulation, electrical, plumbing, and mechanical throughout the reconfigured building to meet the stringent GM Brand requirements.